Residents relax in the courtyard of the Vision in Action asylum in Ciudad Juarez, Mexico. 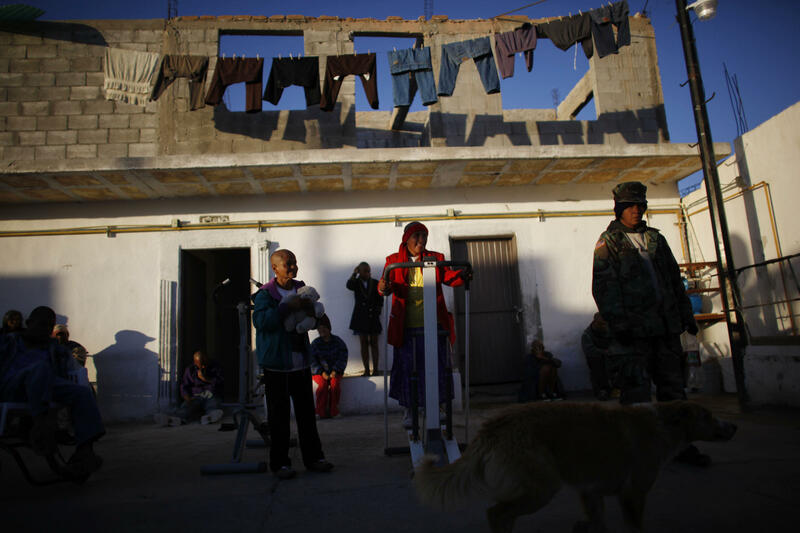 social services are in short supply in Juarez, and many have no place else to go. 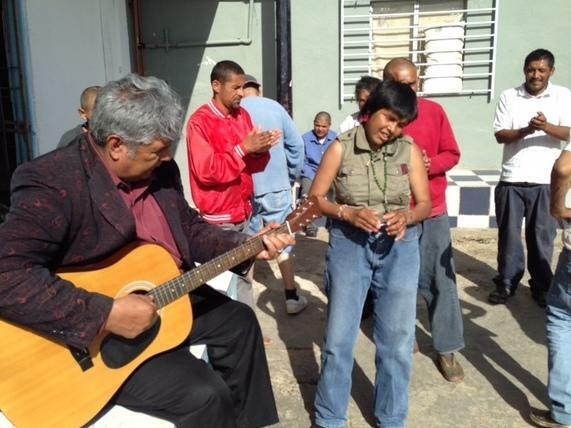 Pastor Jose Antonio Galvan, who founded the Vision en Accion asylum, plays guitar and sings with residents. A resident and his artwork. A painting by Vision en Accion pastor Antonio Galvan titled "Justicia Decapitado." He says painting helps "keeping our mind busy." Fifteen miles past the city limits of Juarez, an insane asylum serves as the last stop for a group of indigent and mentally ill people. It's called Vision en Accion, or Vision in Action, and it sits like a citadel in a filthy desert dotted with dumps and junkyards, in an area haunted by years of violence from the drug cartel wars that claimed more than 11,000 lives. A few of the asylum's 120 residents live behind bars in tiny, solitary cement cells. You can hear them moaning or screaming at times. But most of the people here spend their time doing chores and relaxing in an open courtyard. They're tended to by the evangelist pastor who built the shelter, Jose Antonio Galvan. Galvan plays his guitar and sings with the residents, who seem content and clearly adore him. He affectionately calls them "los pelos duros" — the stiff-haired ones — who arrived unbathed with dirty hair. Many were dropped off by local police, hospital workers or desperate families. Galvan himself scooped up some of them off the streets. "This is like a junkyard for humans," he says. "We are a recycling center for human beings. We believe in hope." Residents arrived as drug addicts, mentally ill, homeless or just destitute. Galvan says some were victims of violence, others perpetrators: cartel hit men or narco-traffickers. A medical doctor who volunteers here, Arturo Fierro Garcia, says social services are in short supply in Juarez; He knows of only one other small mental institution, and a new hospital that offers medicine, but not a place to live. "Unfortunately, the government doesn't do much for these people who have nothing," says Dr. Fierro. "Who wants to care for a crazy person?" No one, he says, except Galvan, who doesn't have a degree, operates ad hoc, hustles for funding and says the best medicine is love. "We have a lot of miracles in here," says Galvan. "Starting with me." Galvan, 64, is a born-again Christian who once was a construction worker in California. He says he became an alcoholic, addicted to cocaine, PCP and crystal meth. He was deported to Mexico, and left behind his family. 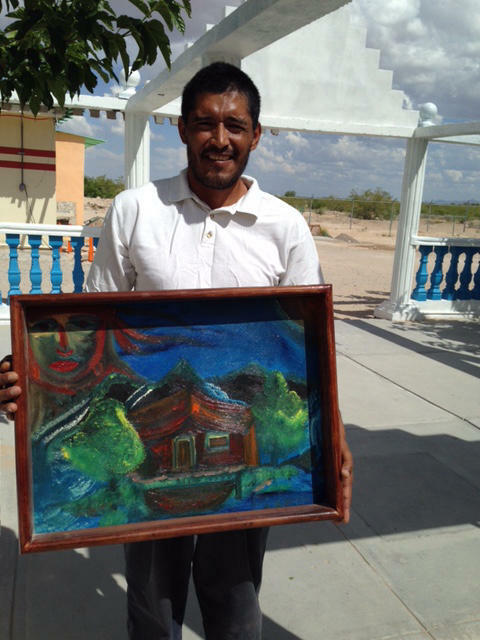 He says at his lowest point, he was living on the streets in Juarez, until he found God. Galvan became a street preacher, and even had his own evangelical radio show. A listener donated this piece of land, where he began building the asylum in 1995. Without any regular government assistance, Galvan relies on food and medicine donations, with the residents caring for each other. Artist Alice Leora Briggs, who has known Galvan since 2008, sometimes conducts art workshops at the asylum. "It is absolutely incredibly that one human being, who is just determined, is making this much difference in the mental health vacuum," Briggs says. "Medication is not always available, so some of these people do have to be isolated," she says. "And it is true that if this asylum was in the United States, it would be closed down yesterday. He doesn't have the sort of facility that would be acceptable. He doesn't have the staffing, the funding, he doesn't have the medication, and so with what resources he does have, it's kind of miraculous what he's able to accomplish." That includes art therapy. Galvan encourages residents to paint whatever wanders into their minds. For Josue Rosales, it's landscapes. He's a former gangbanger who spent 10 years in California prisons for selling drugs. After he was deported, he arrived at the asylum addicted to heroin and nearly dead. It took almost a year to detox. Now Rosales helps Galvan run the asylum, and says he plans to become a nurse. "Painting is like keeping our mind busy," says Rosales. "It makes you think of something else." Something besides doing drugs and being on streets, he says. Another resident, who lost his leg after falling out of a second story window, has a sketchbook filled with drawings of two story houses. Galvan says he's noticed certain patterns in the residents' work. "Let me tell you something about the bipolar people," Galvan offers, switching back and forth between English and Spanish. "The bipolar people are artistas. Their painting are hermosas [beautiful]. They paint landscapes, flowers, the sun, the trees. The schizophrenic people, no. They paint demons, skulls, assesinatos [murderers]." The autistic people just paint stripes, he says. Filmmaker Mark Aitken made a documentary about the asylum, Dead When I Got Here, starring Rosales and Galvan. Aitken says he's seen how making art helps calm so many of the residents. "I did see people painting with utter concentration, and five minutes before that they'd just been walking in circles, sort of jibbering," Aitken says. "So it just showed the power of this kind of therapy." Five years ago, Galvan taught himself how to paint. His work uses religious and political messages; commentaries on the bloody drug wars along the U.S.- Mexico border: weapons, cemeteries, blood. "My paintings are very cruel. They are very, very strong," says Galvan. "We're talking about the narco-violencia." During the recent years of drug cartel violence, the land around the asylum was a dumping ground for bodies. Galvan remembers hearing people scream for their lives, and the shots that killed them. His dog brought back a decapitated head he'd found nearby. When it rains, he says, skeletons still come to the surface near the shelter. Galvan has put all of this in his artwork. In one painting, he depicts Jesus arm-wrestling with the devil, a fight between good and evil. Another looks like a Diego Rivera painting but with skulls instead of flowers. "That's Mexico," Galvan says. "Full of dead people." Aitken says the artwork is powerful. "I think pastor's paintings are hideous," says Aitken. "And they depict the hideousness that's all around him; the carnage, the horrors, the nightmares from Juarez." Galvan's paintings, and those of the residents, have been shown in galleries in New Mexico and Texas, and may soon travel to New York. The pastor says sales of their art will go toward funding Vision en Accion. The Mexican drug wars have left many victims, especially those shattered by violence. Some have found a small measure of refuge outside Juarez, Mexico. A shelter there is the last stop for a group of indigent and mentally ill people who have nowhere else to go. NPR's Mandalit del Barco paid a visit and found that art plays a role in the residents' survival. MANDALIT DEL BARCO, BYLINE: Fifteen miles past the city limits of Juarez, Vision en Accion, Vision in Action, sits like a citadel in a filthy desert dotted with dumps and junkyards. It remains haunted by years of violence. UNIDENTIFIED MAN: (Yelling in Spanish). DEL BARCO: A few of the asylum's 120 residents live behind bars in tiny, solitary, cement cells. But most of the people here spend their time doing chores and relaxing in an open courtyard. They're tended to by the pastor who built the shelter, Jose Antonio Galvan. PASTOR JOSE ANTONIO GALVAN: (Singing in Spanish). DEL BARCO: Galvan plays his guitar and sings with the residents who seem content and clearly adore him. They affectionately calls them los pelos duros, the stiff-haired ones, who arrived here unbathed, thus the dirty hair. Many were dropped off here by local police, hospital workers or desperate families. Pastor Galvan himself scooped up some of them from the streets. GALVAN: This is like a junkyard for the humans. DEL BARCO: A junkyard for humans. GALVAN: Yes. Un centro de reciclaje humano. We are a recycling center for human beings. We believe in hope. DEL BARCO: Some residents arrived as drug addicts, mentally ill, homeless or just destitute. Galvan says some were victims of violence; others perpetrators, cartel hitmen or narco traffickers. A medical doctor who volunteers here, Arturo Fierro Garcia, says social services are in short supply in Juarez. He knows of only one other small, mental institution and a new hospital that offers medicine, but not a place to live. DR. ARTURO FIERRO GARCIA: (Speaking Spanish). DEL BARCO: Fierro says the Mexican government doesn't do much for them. "Who wants to care for a crazy person?" he asks. "No one." DEL BARCO: No one except for Pastor Galvan, who doesn't have a degree, operates ad hoc, hustles for funding and says the best medicine is love. GALVAN: We have a lot of miracles in here. DEL BARCO: The 64-year-old Galvan is a born-again Christian who once was a construction worker in California. He says he became an alcoholic and was addicted to cocaine, PCP and crystal meth. He was deported to Mexico and left behind his family. He says at his lowest point, he was living on the streets in Juarez until he found God. Galvan became a street preacher and even had his own evangelical radio show. A listener donated this piece of land where he began building the asylum in 1995. Without any regular government assistance, Galvan relies on food and medical donations with the residents caring for each other. ALICE LEORA BRIGGS: It is absolutely incredible that one human being, who is just determined, is making this much difference in the mental health vacuum. DEL BARCO: Artist Alice Leora Briggs has known Galvan since 2008. She sometimes conducts art workshops at the asylum. BRIGGS: Medication is not always available, so some of these people do have to be isolated. And is true that if this asylum was in the United States, it would be closed down yesterday. He doesn't have the sort of facility that would be acceptable. You know, he doesn't have the staffing, the funding. He doesn't have the medication. And so with what resources he does have, it's kind of miraculous what he's able to accomplish. DEL BARCO: That includes art therapy. Galvan encourages residents to paint whatever wanders into their minds. For Josue Rosales, it's landscapes. He's a former gang banger who spent 10 years in California prisons for selling drugs. After he was deported, he arrived at the asylum addicted to heroin and nearly dead. It took him almost a year to detox. Now, Rosales helps Galvan run the asylum, and he plans to become a nurse. JOSUE ROSALES: Painting is like keeping our mind busy. That make you think something else you know. DEL BARCO: Something besides drugs and being on the streets. DEL BARCO: Another resident who lost his leg after falling out of a second-story window has a sketchbook filled with drawings of two-story houses. Galvan says he's noticed certain patterns with the artwork here. GALVAN: Let me tell you something about the people, bipolar. The bipolar people, they are artistas (speaking Spanish). They paint landscapes, flowers. They paint the sun. They paint the trees. And the schizophrenic people, no. They paint demons. GALVAN: And then the autistas, puras rayas, los autistas. DEL BARCO: The autistic people just paint stripes. DEL BARCO: Filmmaker Mark Aitken made a documentary about the asylum called "Dead When I Got Here." He says he's seen how making art helps calm so many of the residents. MARK AITKEN: I did see people painting with utter concentration. And five minutes before that, they had just been walking in circles sort of gibbering. So it just shows the power of this kind of therapy. DEL BARCO: Five years ago, Galvan taught himself how to paint. His work uses religious and political messages - weapons, cemeteries, blood. GALVAN: My paintings are very cruel. They are very, very strong. We are talking about the narco violencia. DEL BARCO: During the recent years of drug cartel violence, the land around the asylum was a dumping ground for bodies. Galvan says when it rains, skeletons still come to the surface near the shelter. He's put all of this in his artwork. You have a painting of Jesus arm wrestling with the devil. GALVAN: It's a fight. The evil and the good, see. DEL BARCO: This one looks like a Diego Rivera painting, but with skulls instead of flowers. GALVAN: Yes. That's Mexico. It's full of dead people. DEL BARCO: Filmmaker Aitken says the artwork is powerful. 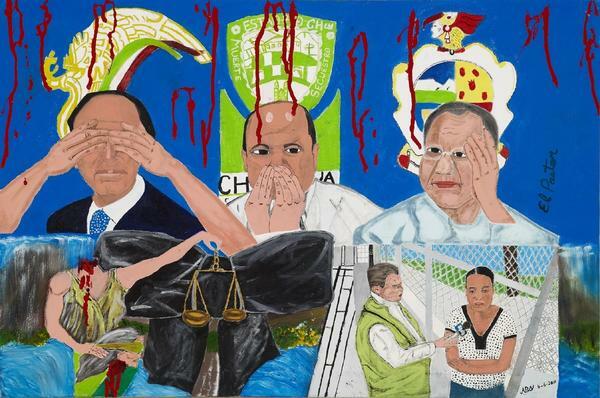 AITKEN: I think pastor's paintings are hideous, and they depict the hideousness that's all around him - the carnage, the horror, the nightmares from Juarez. DEL BARCO: Galvan's paintings and those of the residents have been shown in galleries in New Mexico and Texas and may soon travel to New York. The pastor says sales of their artwork will go toward funding Vision en Accion. Mandalit del Barco, NPR News, Ciudad Juarez, Mexico. Transcript provided by NPR, Copyright NPR.